We’ve recently had several inquires about cold mangles, an environmentally friendly method for pressing your household linens. Traditional cold mangles have been used for centuries in Northern Europe. Linens and other flat fabrics were placed between two rollers or underneath a weighted bed with varying amounts of pressure applied to achieve a smooth fabric. Cold mangles manufactured today are electrified. 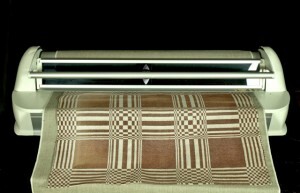 Fabric is placed on a feeder sheet of cloth and then fed between 2 smooth aluminum cylinders and rolled under pressure. 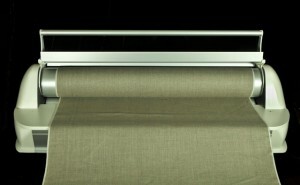 We’ve included photos of a cold mangle we are interested in carrying at Halcyon Yarn. If sold in the United States, the cold mangle would retail between $500 and $700. We’d like to get your thoughts. Is this a product in which you’d be interest? Let us know if you think Halcyon Yarn should sell cold mangles. Leave us a comment or send us an e-mail to service@halcyonyarn.com. Wondering if things have changed? Will you follow up and see about carrying to cut down on individual shipping costs? This is great news! Thank you so much for letting us know. I will follow up and let you all know what I can find out as soon as possible. Many thanks! As I was reading this thread I was dreaming by the end there would be great news that at last, Sweden had relented and were allowing the import of cold mangles to the US, but alas! Having spent time in Sweden recently and seen the incredible stone mangles at Mangleboden in Stockholm and Tvätt-och kallmangling in Munso, I know cannot go back to weaving linen without mangling. I live in Canada and am wondering if their non-import rule to the US also applies to Canada? I want one so badly now I was literally imagining trying to buy one of the big old cast iron and stone ones that exist in Sweden and putting it on a boat to Canada and setting up a community mangle somewhere. Sadly we have not had any luck getting the international manufacturers to budge on this, however we do continue to look for sources. I’m not sure if you’d have better luck getting something into Canada. If anyone has any leads please let us all know! I’d love to see pictures of the stone ones you saw recently in Sweden – please share if you’d like. I also love the idea of a community-mangle! Makes me think of the old village grist mills, what a lot of good work and good company those kinds of common resources could bring to a community. Again, I wish we had better news to offer you all, but we will keep trying and of course keep you posted if we find a good resource or ideas to share on this topic. Sadly, no… There is still no company exporting to the US and with tariffs dramatically increasing prices on metals this probably won’t be the year for domestic production or improved pricing elsewhere either. As always we will continue to check periodically and are always glad to be reminded of interest! I have recently been in touch with a distributor in the Netherlands who was initially enthusiastic about working with a retailer in the US (Vavstuga Swedish Weaving School) and ran up against a brick wall with the Swedish company. They Will. Not. Export. to the US. Perhaps if a bunch of weaving-related retailers such as Halcyon, Vavstuga, Woolery, etc, got together and jointly approached the company, giving the numbers of American weavers who REALLY REALLY want these machines and who are just as smart as Swedes, Belgians, Dutch….they might be inclined. This is beyond frustrating! If you carried cold mangles I would buy one in a heartbeat! Yes, please! I would order today! Yes, I have dragged mine from Sweden and need a new one. Can’t wait to hear whether you can bring them to the US! We’ll do our best and keep you all posted! Just found this old thread, but I too, am looking for a cold mangle. Thanks for your interest in a cold mangle! We continue to check on their availability in the US, and for now we are still unable to import them. However, we will be keeping our eye out and if they become available again we will certainly carry them and announce it to our customers. We’re keeping our fingers crossed! Yes, I am very interested in purchasing a cold mangle. Thanks DJ, we’re still checking in periodically on this. Unfortunately, we’re still not yet able to retail them in the US. We’ll announce it widely when we hopefully find a source willing to supply to the US! I would love to buy a cold mangle. We can buy hot rotary irons in the US. So why not a cold mangle? Please let me know if/when you are able to offer them. I would be very interested in a cold mangle. I desperately want a cold mangle! At one point, Vavstuga was negotiating with a Swedish company, but the final verdict was that the Swedes were afraid to sell in the US because we are “too litigious”. Anyway, if you succeed, I definitely want one, even set space aside in my new weaving studio! Desperately seeking a mangle. Keep hearing hints that they will soon be available but that was 2 years ago now! Yes, please! I would have to save up for a bit – but I would definitely be interested in buying one. There is definitely a lack of supply of new cold mangles in the usa, I have been looking in vain for any. Either way, as long as it is a decent mangle I would get one as I am sure many others would as long as they are aware there are cold mangles available to order. Pls let me know if you decide to carry them! I would love to have a cold mangle. I do have a heat mangle that is ancient. with the possibility of finding a new mangle. I would love to see a US outlet for cold mangles. 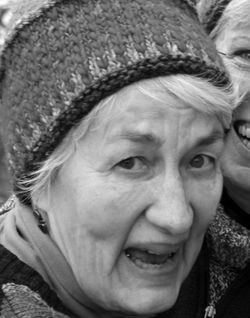 Being on Ravelry & voraciously reading everything there, I believe there would be enough interest. And I would purchase one. Thanks!